Our Star Award collection singles out all of our award products that have a star shape or have stars as part of the award design. The collection contains plaques, trophies, acrylic awards, glass and crystal awards, clocks and other gift items. Jade Glass Achievement Award with Chrome Star Holder Glass 1/2" thick. One holder included. Cardboard gift box included. Jade Glass Achievement Award with Gold Brass Star Glass 1/2" thick. One holder included. Cardboard gift box included. 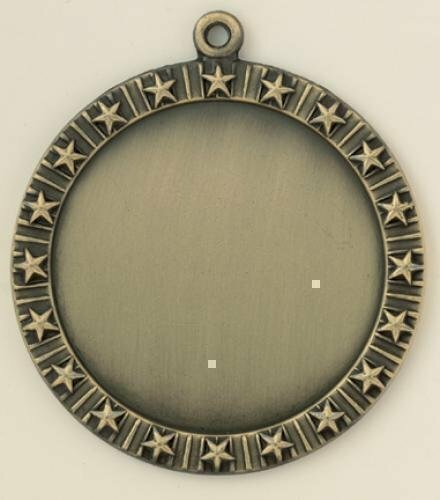 These 2" Mylar holder medals have decorative star design pattern that goes around the entire medal. The front of the medal will take a 2" Mylar so you can customized it for any activity. These medals are 2 1/2" in diameter with a gold, silver, or bronze finish. Just choose a 2" Mylar and ribbon that meets your needs to complete these awards. Solid American walnut star plaque with black recessed area and 5" gold aluminum star. Laser engravable plate(s). Individually boxed. Solid American walnut plaque with a large eagle casting and three color American flag insert. Laser engravable plate(s). Individually boxed. Blue art glass star with gold metallic highlights. Laser engravable gold aluminum plate. These glass awards are packaged in satin-lined, padded gift boxes. Each piece of art glass is made by hand, air bubbles and color variations are common. This 7/8” thick acrylic award features curved bevels that form the outline of the star shape. The use of color in the bevels and on the star serves to create a variety of award options each with its own individual appeal, but all with a rich feel.